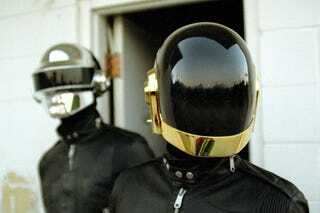 The dudes from Daft Punk always look like space travelers from some party planet vastly cooler than our own, but they haven't been rocking the same helmets this whole time. This chart provides a nice overview. The graphic, created by wolf boy2027 over at TheDaftClub forums, traces the group's headgear from the Discovery Days up through their Tron: Legacy cameos.